Organization: Middle gate equidistant from outside players, gate 2 yards wide. Instructions: Players will be able to shoot through the gate to their partner. Set up our standard 3-line passing channels either side of the goal. Cones at every numbered position. One player at every position, incl GK. Balls and extra players at positions 1, 4 and 6. Play in order of number. 1-2-3 and 6-7-8 are our standard 3-line passing. 4 serves to 5, who checks back, spins and has a shot. Players rotate in order of number. Wait to play the pass until the shot is taken. Second knuckle to strike ball. Follow through - land on standing foot. 3 teams, rotate only within your channel (left, center, or right). Play for 3 minutes then teams rotate channels. Keep score, winner is the most after shooting from every channel. Even teams, 1 ball per player. 2 goals and cones as shown. Phase 1, unopposed: Both sides start at the same time. Player must dribble around cone and then is free to shoot. 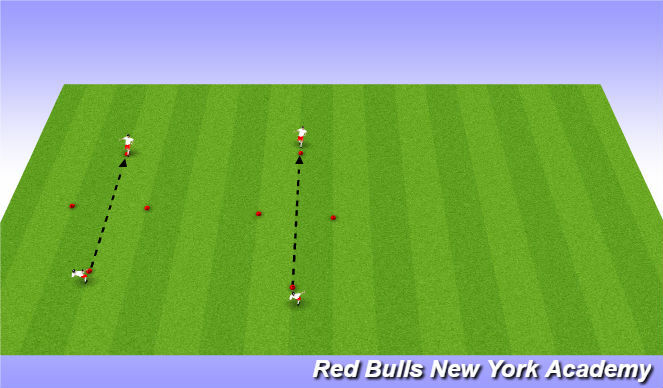 Players collect their own ball and get in opposite line. As soon as both shots are taken next players go. Phase 2, partially opposed: Same as before but now only the first player to score gets the point. Play to 10. Phase 3, fully opposed: Continuous 1v1s. One side goes at a time, first player gets a free shot. As soon as team A shoots player from team B attacks the opposite goal with player A defending. Rotation: shooter becomes defender. Play to 10. Field players are 5v5+1 with GKs. There are also 4 neutral bumpers, 1 on either side of each goal. Neutral bumpers have 2 touch max, 2 seconds to play a return pass. Play 3 minute games or first to score, normal rules except re-starts can be pass or dribble. After you shoot, you must touch the post. 3 points for win, 1 point for draw. Near post or far post?